We are proud to announce the introduction of the Super Zappicator, the first BODY zappicator (also known as the Body Zapper) available to the public. It has twice the power of our food zappicator, and can do a few things not possible with a zapper alone. We developed this at the request of naturopaths from Alberta, Canada, and the Super Zappicator has been very well received by their clients. After more than a year of testing, we are now offering it to you! We call it the Super Zappicator because it not only works well for food (like a FOOD ZAPPICATOR), but it has other uses for the body directly, including the teeth. Think of it as a magnetic antenna to send zapping power directly into the body as well as into food. This is very different than the zapper current, which energizes the white blood cells, according to Dr. Clark. With the combination of the Professional Auto-Zap zapper and the new Super Zappicator you are equipped to tackle any cleanup job in the body. No diagnosis or tuning is required. And the application does not conflict with any other treatment you may wish to employ. Simply place the face (smooth side) of the Super Zappicator on the area of concern, and start the zapper. Let it run for 7 minutes (till the first beep), then give it another 7 minutes by pressing Stop, then Start again. Repeat as desired. The signal penetrates about 10 inches (25 cm). Typical applications will be from 20 to 30 minutes (3 or 4 seven minute repeats). Dr. Clark says a low frequency (1 kHz) zapper is more effective with a zappicator than a 30 kHz unit. When I asked her about using our Auto-Zap at 2.5 kHz, she said it would work very well. 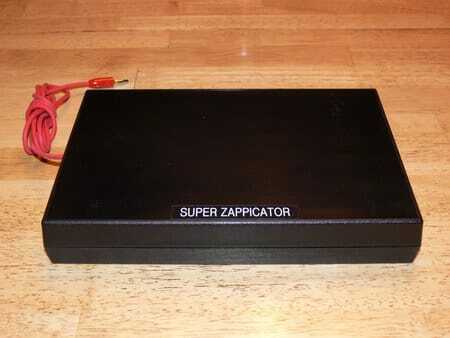 Note: Although the Super Zappicator was designed by using the Auto-Zap zapper at 2.5 kHz, any zapper will power it, as long as that zapper uses 3kHz or below. "The zappicator adds destructive power... Not only can PCBs, asbestos and benzene be destroyed but a whole host of toxic molecules. gallic acid, the trigger for SV40 virus"
CHECK THE LIST AGAIN! What else can clean food like this, let alone in 10 minutes? "A big advantage has been gained from electrical treatments. All parasite eggs and stages can be killed quickly, and to any depth, by any one of the three methods [sonicator, food zapper, and food zappicator]. You can now cook, bake, poach or fry them the usual way. Do not grill." "Most are sprayed with combinations of wax, dye, pesticide, antisprouter, antimold, etc. Azo dyes (Fast Green and Fast Garnet) are present in most sprays, as are lanthanide metals. They penetrate the food deeply. But double soaking in hot water for one minute removes it. Even organic bananas, pears, plums and grapefruit must be double soaked this way. Peeling is not sufficient. Then zappicate them to destroy food phenolic chemicals, parasite filth and leftover traces of sprays. Always zappicate the final product unless you know each item has already been treated." On page 256 she adds: "... you may add nuts; their aflatoxins are removed by any electronic treatment." It changes the angle of light that is passing through each molecule of food further to the left if an amino acid is zappicated. The d-amino acids are changed to 1-amino acids this way. 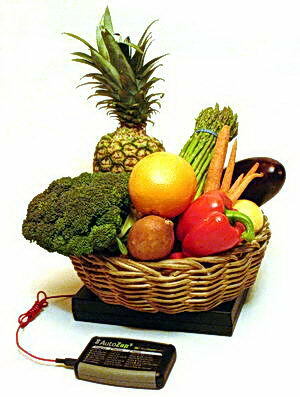 Remember, the body considers d-amino acids as allergens; it only uses 1-forms itself. The food has been improved, to be less allergenic, before you eat it. Of course, changes can come after you eat it. It could change back to a d-form in a southerly zone, as happens to thyroxine (page 125). It changes the polarization of the food to north, if the north side of the magnet faces the food. Food has been made "fresher". Most bacteria, viruses and parasite eggs can't be detected afterwards. Were their growing points disabled by being turned northerly? This could be temporary, if it is reversible, but still useful. Benzene gets oxidized to phenol, at least at trace levels. PCBs disappear, no doubt slightly changed, an important step toward detoxification. Phenolic food antigens disappear if the correct frequency is used. Many are affected between 1000 and 1010 Hz [Dr. Clark says 2500 Hz works well also]. Perhaps they were oxidized further. The body could choose to reduce them again or make something equally toxic, but the ability to make food less allergenic beckons again. A zappicator placed on plastic teeth in your mouth, instead of food, stops seeping of plastic, dyes, or malonic acid from them. Did it complete the polymerization process, or harden it all in some other way? Cerium is too dangerous to rely on this. Only cerium-free dental supplies should be used. Finally, food seems to taste better. Maybe changing d- to l-amino acids or alpha to beta forms or l- to d-sugars can be tasted. These are all effects of zappication. Only more research can give us more advice. Again, we must not demonize the opposite polarization. It is part of us, too, just as the seed belongs to the fruit. But much greater care is needed in handling south pole forces. Notice how Nature has its south pole seed securely encased. Don't do south polarization experiments till you have gained much experience with northerly ones. Research on food and water, finding what is good for us and what is bad, has barely begun. Food is fascinating, all the more when we're hungry. As a species we are very hungry. Perhaps we would only need half as much food if it was correctly polarized for our bodies, and at the same time give us much more energy than we have now. With these purposes in mind, make yourself a zappicator (page 532) but don't throw away the Ancient Ways yet. Don't depend on this to sterilize food." 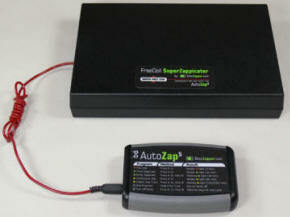 NOTE: the Food Zappicator requires a low-frequency zapper (like our Professional Auto-Zap) to power it. GUARANTEED QUALITY: We test each Super Zappicator to ensure that it has the correct magnetic polarization specified by Dr. Clark, and cover it with a 5 year parts and labor warranty. You can easily test the polarity yourself, as Dr. Clark recommends, using any ordinary magnetic compass. Please note: Due to the personal nature of the zappicator, there are NO REFUNDS for the Super Zappicator. Dr. Clark's Copyright Notice: "The Cure for all Diseases": Copyright 1995 by Hulda Regehr Clark, Ph.D., N.D. "The Cure for HIV and AIDS": Copyright 1993 by Hulda Regehr Clark, Ph.D., N.D. All rights reserved. Permission is hereby granted to make copies of any part of this document for non-commercial purposes provided the original copyright notice with the author's name is included. Published in the United States by New Century Press, 2232 Verus Street, Suite D, San Diego, CA. 92154 We provide this material for informational purposes only. We do not prescribe, diagnose, or make medical claims. Your results may vary. We do not offer or sell any medical devices. If you use the information in this site without the approval of a health professional, you prescribe for yourself, which remains your lawful right, but the author does not assume any responsibility. Except where otherwisw noted, the information on this page is authored and owned and by Arthur Doerksen, natural person, and is protected under the United Nations Universal Declaration of Human Rights and the Canadian Bill of Rights. Please read full disclaimer here. Any statements about a Hulda Clark "zapper", colon cleansing, alternative medicine, alternative cancer treatments, nutritional supplements, cancer and others topics are for information only. The Hulda Clark zapper is not recognized by the FDA.